This lot was produced by 10 small holder farmers, all of whom produce only around 6 bags of parchment coffee a year. All live nearby one another and are members of the Santuario Association of Coffee Producers (Asociación De Productores Cafetaleros El Santuario), which works with small scale producers in Cajamarca, Peru. The lot name 'La Palma' was chosen as it is the town closest to the farms of all three producers. The farms, as is typical of the region, are small, at around 1.5 hectares each. 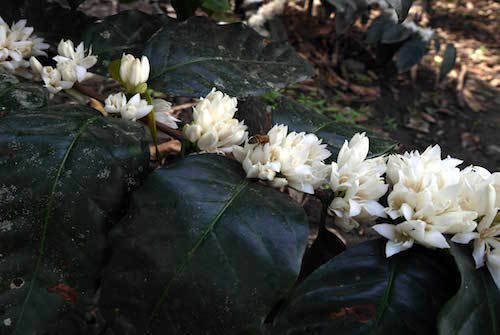 The coffee is fully shade grown and produced using traditional methods married with some of the most cutting-edge organic agricultural techniques. All of the contributing farmers produce their own food for subsistence and may occasionally sell on surplus, but for all of them, coffee is their main economic activity, and they are very committed to improving their understanding of quality so that they can place their coffee on the speciality market. Santuario supports them in these efforts. During the harvest, coffee is selectively handpicked with only the ripest cherries being harvested at each pass.